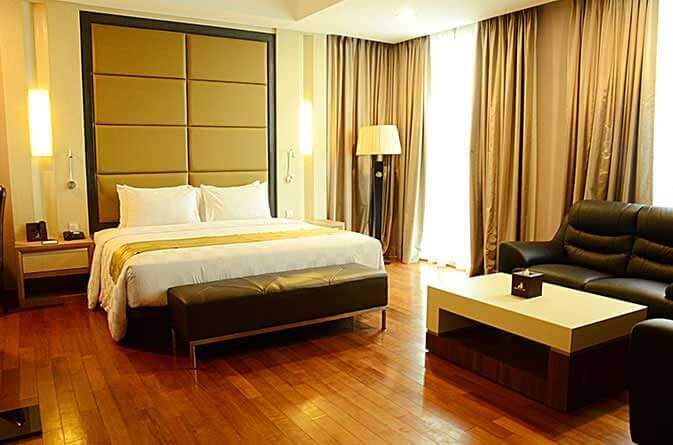 Nagoya Hill Hotel in Batam, Indonesia is a truly convenient retreat in the heart of Batam Central Business District. It occupies a prime spot and is just a minute away from the popular Nagoya Hill super block shopping mall. We know that you can’t put a price on convenience. We are your best choice if you are looking for a clean and comfortable place to stay before and after your shopping spree, plus free breakfast. We have 233 rooms done in clean and contemporary design. Be it our Superior Room or Executive Suite, our accommodations provide comfort with a minimalist touch. Our guest rooms are equipped with an array of amenities. Enjoy the use of cable Smart TV, IPTV and in-house movies, and high-speed wireless internet access. The rooms also have mini-bars and coffee and tea-making facilities. We take care of the little details so we provide toiletries, slippers, and shaver outlets. Staying at our Executive Club Floor lets you experience an enhanced level of service, comfort and convenience. For instance, you get to enjoy the privilege of using the club lounge for your business discussions.We have dedicated facilities for business travelers. These include a fully equipped Business Center and the state-of-art sky ballroom. We also have a convention hall and multi-purpose meeting rooms. When it comes to leisure and other needs, guests are entitled to the use of our fully equipped gymnasium, swimming pool and indoor sauna. We have a pool snack bar between the swimming pool and gym area where you can enjoy your favorite drink and snacks. Nagoya Hill Hotel is approximately 35 minutes from Hang Nadim International Airport. We are 20 minutes from Batam Center ferry terminal and 10 minutes from Harbour Bay ferry terminal. We can arrange for transportation from and to the airport and ferry terminal. Our Front Desk Service or the Concierge will be more than willing to help you out. We can also help you get to the nearest tourist destinations such as the Jabal Arafah Mosque and Ocarina Theme Park. Close the doors of your room and revel in the feeling of comfort and security that is yours during your stay. 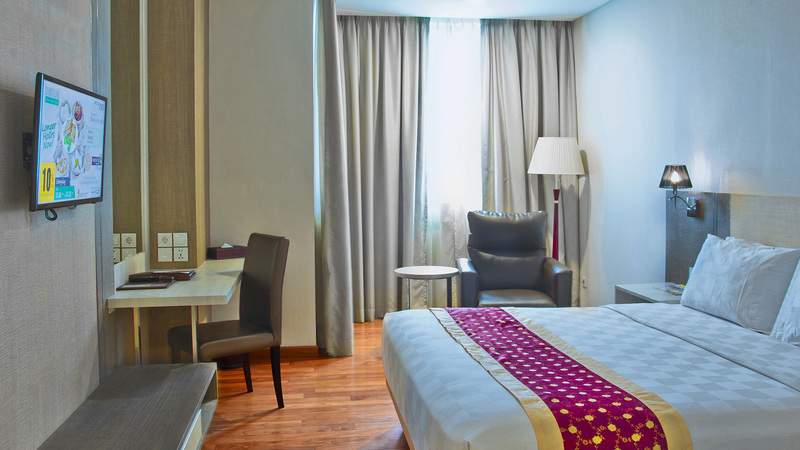 The spacious beds with soft pillows and blankets are complemented by flawless air-conditioning system. 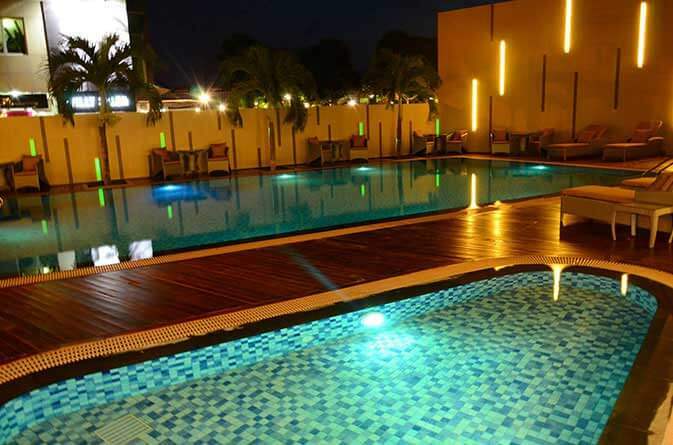 We provide amenities that ensure the most relaxing stay in the midst of the busy activities in Batam. We take care of your business and leisure needs by providing services and facilities that will make your stay as comfortable and convenient as possible. Whether you have a business meeting to conduct or you just want to relax and chill in one of the best spots in Batam, we have your needs covered. A great hotel is not just about comfortable rooms, it’s also about convenience. With our superb location, you get nothing less than that. We are just 35 minutes from the Hang Nadim International Airport and just 10 minutes from Harbour Bay ferry terminal. The Nagoya Hill shopping centre is just a minute’s walk for the hotel.